Here's a thread dedicated to the DRM1. And it has so many possibilities, that it would go forever to demo it. Who know, maybe one day I'll give it a new try... But for now, here are a few videos where the DRM1 plays a big role. Here all sounds are from DRM1 + Xpander being FMed (by QuadSine itself FMed) + PT Delay modulated. As said in another thread most of my patches with the Bugbrand have the DRM1 playing a role, so I won't add them here, but you get an idea. 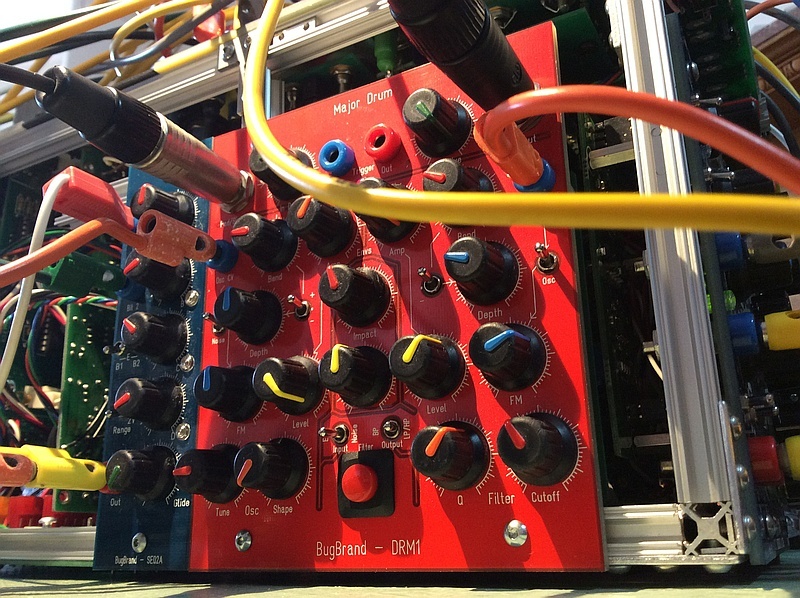 The DRM1 is much more than a drum module. The 2 separate channels are very capable. It’s so compact and so powerful. I know I repeat myself often here, but the DRM1 is really a beast (with an expander even more powerful). In my Top 5 best modules ever (if not the first!). All brands included. For what I do at least. This one is a bit hors-sujet. So I take it down here. I don't delete cause I like it hihi. Well my contribution is the main page demo sounds - most of these were, I think, made with a DRM1 and a DRM1+X. Not sure what would have been driving the clocks etc, or any accompanying modular - they're all fairly direct & experimental, but there's some good sounds & rhythms within. https://soundcloud.com/bugbrand/sets/drm1 --- set of 5 tracks - can't embed a playlist..
What may come drum-centrically in the future - I'm not sure yet, but it is in mind. I do like the variety you get from a DRM1 and an expanded DRM1+X - kind of like 3 complimentary synth voices. Perhaps a future full frame in somewhat more modular approach - though maybe that would lose the immediacy of the current DRM1 presentations. Well, I often feel they work best as a symbiosis with other bug designs - both the driving and the post processing - but then have played a fair bit with other things like LXR and Arturia bits for the driving and various other things for processing. Cool thread. I would like to get hold of a drm-1 some day. Here's another, a short one. It's only the DRM1 with Xpander (delay and reverb). I hope you can listen loud! Perhaps a future full frame in somewhat more modular approach - though maybe that would lose the immediacy of the current DRM1 presentations. The ergonomy on this module is awesome. The sounds you posted are so typical. The DRM1 has its own character. Those are mainly expanded DRM1 with a touch of Ensoniq SQ80. Here's 5 mins of a jam from the other night; 1 DRM-X and PT-Delay into Stereo Compress. Wrote a review a few years back, so here's a track with nothing but the DRM1. Also, nearly every kick drum on my last three albums has been the DRM1! And here's the thread about mine being converted to Eurorack. Hey! I'm so glad new posts are coming in!!! The feedback experiments are very interesting! Reviving this sleeping thread as it seems like the appropriate one. Here is a brief track prominently using one DRM (no expander). I didn't set out with a particular drum sound in mind but what I came up with has kind of a frame drum feel to it. Live in single minded mono, no editing. BugBrand Chirper is the drone. Ask Santa for one. Metallic FM sound at beginning is Doubleknot, a bunch of frac & euro modules for timing, processing, effects. Blacet ID 2510 and KK TwinPeak near the end. It's ben a while since I posted a vid, and there's no reason why batches should be the only one doing so in this forum , so here's my contribution to this thread about these fantastic modules : 2 DRM1+X going trough Crossover Filter, Spring Tanker and Stereo Compress. The DRM's are the only sound source here. Can't wait for the expanders and ddsr and other clocking rhythmic goodies to use with mine. You're right about videos though - I will try to make one myself this week to contribute. Feeling similar rhythmics & tones from my current small setup - it is amazing how rich a palette can come from just two sound sources (I'm mainly playing DRM2 proto and Chirper currently) and some processing. Just put together a row based on DRM and SEQ. First Test - sources added one by one, pause, wiggling filter. Looking forward to pairing it with other stuff. A quick first-time play of my portable system jamming with the DRM/SEQ row. Next I need to teach it to swing a bit. can anyone share favorite methods of varying gate voltages to achieve some dynamics? seems like most anything that sends a gate does this at a fixed value.